My father was a modern thinker who used our place as a hobby farm. He experimented with new chemicals and hired the owner of a combine to harvest his crops. Our neighbors, many of them first or second generation German, Dutch or Polish immigrants, still preferred the old way of doing things. They fertilized with cow manure. At harvest time they cut their grain, stacked it in shocks in the field, and thrashed. While I was too young to participate in the heavy work, I was often recruited to operate the tractor and pull a wagon as the workers walked beside it, loading the shocks. I then would pull the loaded wagon to the thrashing machine, usually powered by a large John Deere tractor, operating somewhere near the barn. We could work our farm then with a tractor just large enough to pull a two-bottom plow. I recall spending most of a day pulling a harrow over a 40-acre plot of ground, or perhaps a day or two getting that same field plowed. 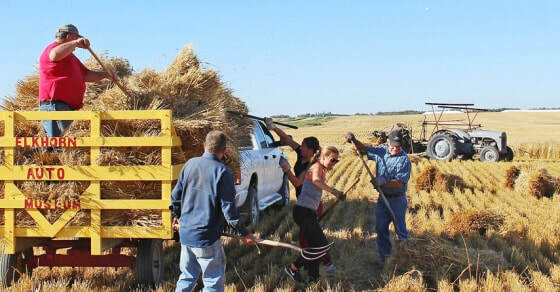 If we could harvest 30 bushels of wheat from an acre, we thought we had a good crop. I remember the year my father, who was a chemist by profession, experimented with a high-nitrogen byproduct from the factory where he worked. He tried it as a fertilizer on strips across his wheat field. That year we amazed our neighbors when the experimental part of the field yielded 50 bushels to the acre. Today's farmer hangs his head if he brings in anything less than 60 bushels from that same acre. Things have changed in a big way since I left the farm. During my years on various Michigan newspapers, I never forgot the farm life. I watched the small family farms disappear as they were bought by the more prosperous area farmers. These new farm operators, forced by tighter pricing, reduced profits and rising operating costs, turned farming into a highly mechanized business. Only the best and most aggressive operators survived. They bought land, expanded to hundreds and sometimes thousands of acres, tore down fences, cut down trees, bulldozed over the little ponds, and farmed with massive machines capable of plowing, conditioning and planting a 200-acre field in a single afternoon. I am sure they never stopped for a killdeer nest. They were too busy to care. They seemed to be in a race against the wolf, which always threatened to call at their door. With farmers racing into new and innovative ideas designed to grow more crops at lower cost, it should not be surprising that they now find themselves caught up in a great bio-tech dilemma. They battle such unbelievable things as Mad Cow Disease, believed caused by placing ground animal parts in animal feed, and attacking the environment because of the chemicals they use to keep their crops free of pests. Many are buying genetically modified seed that "accidentally" spread its pollen all over the American farmland and produces food that people believe are dangerous to consume. People in Japan and Europe don't want to eat our corn because its DNA is crossed with toxic chemicals that they fear might make them sick. Hoof and mouth disease, first detected in English livestock, also is spreading. This is a fatal disease only in that the standard approach to stopping its spread is to destroy all of the livestock on an infected farm. Then there are the big food and meat recalls because of the new super bugs like salmonella, listeria and E-coli. People are getting sick and dying from eating foods that once were considered safe. Where is all this leading? There seems to be a general insanity linked to food production, just as exists in most other forms of modern industry. Nobody seems to care for the ecology or the public health, as long as money can be made. Farmers don't have large smoke stacks spewing massive clouds of toxins in the air but what they are doing to our planet is equally as bad as the other big industries. They are busy dumping tons of dangerous chemicals into the mouths of their livestock and on the ground they work. This stuff is getting into our food chain and into the ground and water supplies. There presently exists a giant “dead zone, a large area in the Gulf of Mexico a few miles from the point where the Mississippi River empties, where nothing lives. The toxic chemicals leaching from the farms of America are washing down this great river and collecting there. Researchers say similar dead zones are now found near the mouths of other rivers that pass through large tracts of agricultural land. This should be a warning that we need to change our ways. Because the world is overpopulated and the supplies of food are dwindling, we can be assured that little is going to change. If farmers are going to fight the changing world climate and the advance of insects and diseases that attack their crops, these methods of farming, developed by such chemical giants as Monsanto, Dow, Bayer, Syngenta and DuPont, appear to be a necessary dilemma. When the chickens come home to roost, however, we will be sorry we took the course we chose.